The Holy Family Center’s Peer Mentor Program, based at Nazareth Hospital and fully funded by Tree of Lives, is garnering global attention in the battle against HIV in adolescents and youth. 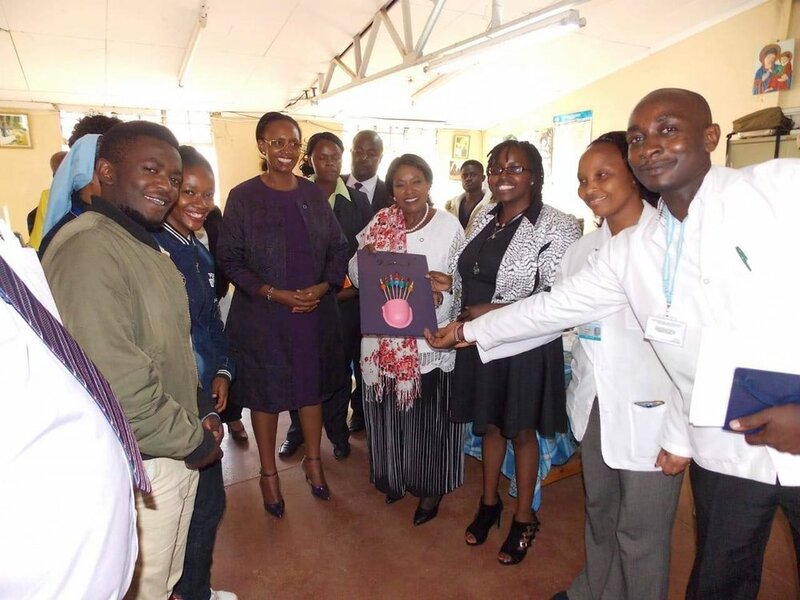 Last week, the First Lady of Zimbabwe visited Nazareth, accompanied by the First Lady of Kiambu County and top public health officials, to learn first-hand about the work HFC’s peer mentors are doing to bring HIV+ teens and young adults together to build community and combat the stigmas surrounding HIV/AIDS. The Peer Mentor Program at Nazareth has become a model for leading the fight and educating young people, ages 15-25, about the available treatment, drug- adherence requirements, and support options available for those who have HIV/AIDS. This age group is the fastest-growing segment of the population contracting the virus, making the peer mentors’ work vitally important. Next week, a U.S. delegation from the Global AIDS Coordinator’s office will visit Kenya to determine the needs of HIV+ adolescents and youth. The results of this meeting will help inform future policies and funding. Two of HFC’s peer mentors have been selected to attend this high-profile gathering. Kiambu County health officials will also visit Nazareth again next week to discuss how they can roll out the Peer Mentor Program model to other facilities in the county. We are so proud of these young people and the amazing difference they make every day!